NOTE: This article was written for Charity Village. They are hosting a Webinar that I will be presenting — and you are invited. Scroll down — and see here for more! Think of a time when you were in a conversation and you felt truly heard. What did that feel like? Chances are it felt good. You felt respected. Understood. Maybe even cared for. But these are busy times. Most of us are juggling chaotic schedules, heavy loads, and dealing with an accelerated pace of work and life. Are you feeling tired, rushed, pressured? Conversations that connect matter more than ever but increasingly are becoming a casualty in a world with fast, high-pressured work/lives. We interrupt. We listen superficially. We miss clues. We focus i-centrically – protecting our own viewpoints. And far too often in our rush to get things done we miss the mark and don’t hear or get an accurate understanding of the full situation. And then there’s email. A necessary tool but sometimes a poor replacement for a real conversation. Poor listening is often the culprit of misunderstandings, relationship difficulties, and stalemates in conflict or tough situations. It can be the cause of missed opportunities, and untapped potential — in team performance, engagement, donor relations, personal connections, and much more. In the vast repertoire of conversational skills, listening is probably one of the most important and yet frequently the most compromised. Paradoxically, most of us already have an innate ability for quality listening and may demonstrate this naturally within various conversations. But for various reasons we may lose touch with our deep-rooted capacity to listen and may just not be connecting with it in any given situation. The default for many of us is the “UNlistening” mode. When we are stressed or feel triggered by a threat of some kind (real or perceived) the abilities that support good listening close down. This isn’t just about personality. This is neuroscience. There is proven science that when our stress brain (the amygdala) fires up due to a perceived threat, we temporarily lose access to our executive brain functions like empathy, listening to understand and connect, and more. We can get caught up in our own inner turmoil and can’t tune in to others. We believe we already know the answer. When our listening is anchored in assumptions, conclusions, and untested guesses, we are not listening for anything new but rather listening to confirm what we believe we already know. This filtering biases and limits what we can truly hear in any given conversation. We assume there is only one right way or answer. When we believe our way is the best or the only right way our listening focuses on protecting and proving our point. We become addicted to being right so we direct our conversations and filter our listening to find ways to prove or negotiate our perspective. Our listening in these situations will be about making our case and can leave little, if any, room for discovering, connecting, or understanding. Whether it’s because we are rushed or otherwise, we often listen only to the words and grab the first layer of meaning that we attach to those words. We miss other clues and possibilities and don’t connect with the person’s true intent. We run with that and risk missing some of or the entire truth. We can all likely shore up our game on the listening front. As I write this article, I can identify many times that I could have done better myself on the listening front. I know I’m in good company. Most of us are well-meaning and even skilled communicators, but these “UNlistening” habits are far more common than we may think. The hallmark of healthy conversational dynamics is generous and genuine listening. Listening to connect; to genuinely understand; and to seek ways to share success – are all paths to better outcomes. People, teams, and cultures that cultivate good listening habits build more trust; inspire better performance, and boost engagement. The good news is that most anyone can learn and/or improve skills and habits associated with high quality listening. And there is no greater gift – to yourself and others — than to give the gift of good listening. With it comes a feeling of being respected, heard, and maybe even cared for. The returns can be exponential. Join me for a one-hour Webinar – generously hosted by Charity Village on April 27th at 1 pm ET. Supercharge Your Listening Skills Webinar: April 27 at 1pm – 2pm ET. Eileen Chadnick, PCC, ACPC, ABC (@Chadnick) is an ICF certified executive and leadership coach; a communications pro (20+ years experience) and principal of Big Cheese Coaching and Chadnick Communications in Toronto. 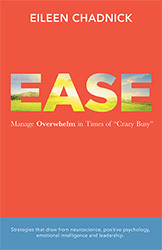 She is the author of Ease: Manage Overwhelm in Times of ‘Crazy Busy’, and a frequent contributor to the Globe and Mail Careers. Eileen draws from the science of positivity, leadership, neuroscience, emotional intelligence – and is also trained as a Core Skills Coach in the burgeoning field of Conversational Intelligence® (C-IQ®).